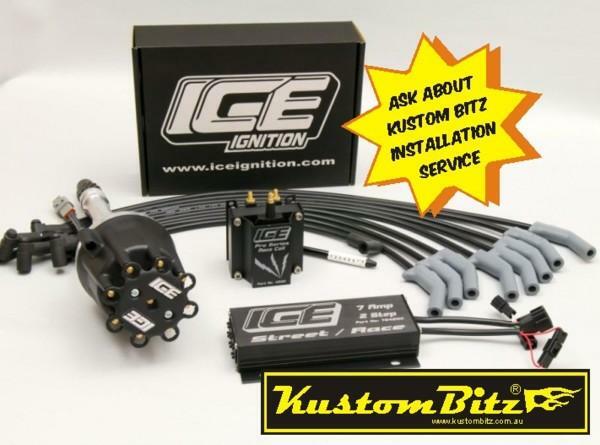 Part# ICE-IK0377 Kit - High energy ignition kit for the Ford Windsor engines, 289, 302 to 351 cubic inch. Made by ICE Ignitions. This kit inlcudes a billet distributor, coil, spark plug leads and the 7642MC electronic control module. 7 Amp Race Series digital ignition control featuring 80 preloaded, push button selectable ignition curves, and dedicated tach output. 2 Step rev limiter with easily selectable built in rpm limits. High voltage ICE 4200 Pro Series Race Coil. 9mm Pro 100 Series plug wire kit to suit your engine including number markers. Installation available at extra cost - please enquire.